San-J Transforms Lunch Time This School Year! There is nothing I like better than a healthy but EASY lunch to make for my children, especially now that my son is in school and we have to pack a lunch every day. Well, this year, San-J is making lunch time easy! 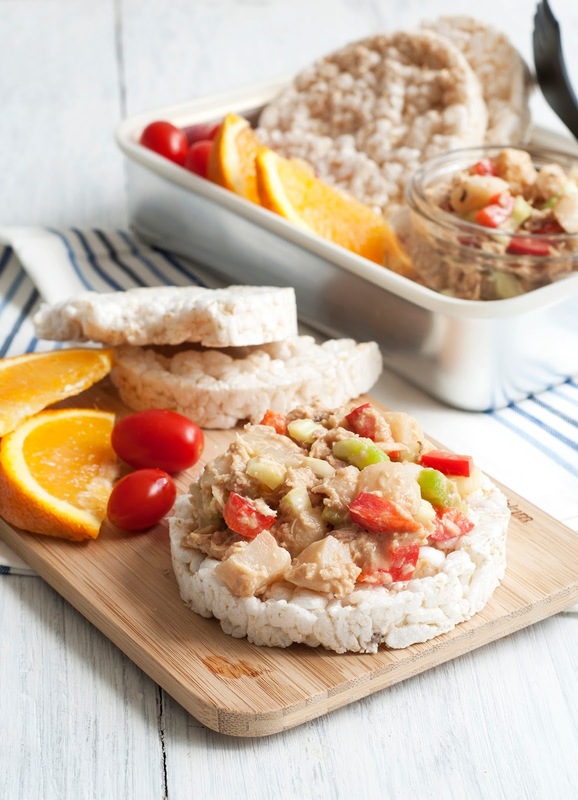 This school you can create simple and delicious Asian -inspired lunches with San-J’s line of premium gluten-free Tamari and Asian Cooking Sauces, from Asian BBQ Chicken Wrap and Chicken Bites with Peanut Sauce to Vegetarian Faux Sushi and Polynesian Tuna Salad. Asian-inspired lunches have never been this easy and flavorful. All of these recipes are gluten free and have less than 10 ingredients (some only 4), including one of San-J’s natural, gluten-free cooking sauces that are now Non-GMO. 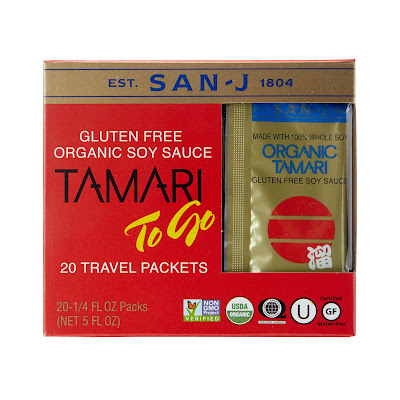 You can carry San-J’s Tamari To Go Packs in your lunchbox to add flavor to left overs, veggies or rice. Asian BBQ Chicken Wraps: Shredded Asian BBQ Chicken wrapped with sweet Apple Cider Vinegar Coleslaw. 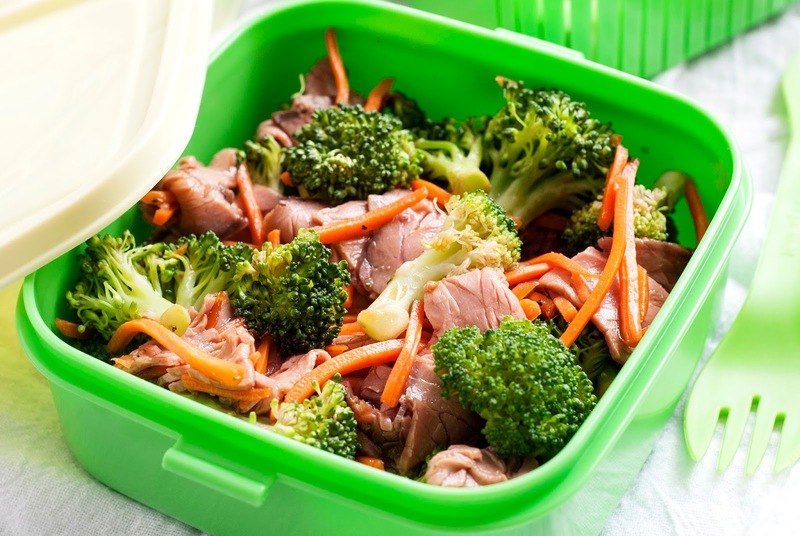 Beef & Broccoli Salad: Roasted Beef with broccoli and carrots covered with Mongolian Sauce. Chicken Bites with Peanut Sauce: Chicken bites dipped in Tamari Soy Sauce, honey and peanut butter sauce. Polynesian Tuna Salad: Pineapple, water chestnuts with celery and red peppers mixed with Tuna and S weet & Tangy sauce served over rice crackers. Teriyaki Chicken and Rice Soup: Chicken and rice with shredded carrots in a gluten free chicken broth and Teriyaki Sauce base. Vegetarian Faux Sushi: San-J Orange sauce flavored tofu spread rolled with mixed green salad, English cucumber and avocados in a soft tortilla. The one I am for sure incorporating into our rotating weekly lunch menu is the Polynesian Tuna Salad! Combine all ingredients including San-J Sweet & Tangy Sauce, except the rice cakes in a mixing bowl, stirring well. Can be made the night before and stored, covered, in the refrigerator. To pack for a lunch, pack the tuna salad in one container and place the rice cakes in a sandwich-sized food storage bag. To eat, scoop some salad onto the rice crackers. San-J’s complete line of seven Asian Cooking sauces are not only Gluten-free and kosher, but also now Non-GMO Project Verified (ARP of $4.19). For packed lunches you will not want to forget San-J’s Tamari To Go Packs (ARP $4.29/Pack of 20). They are a great way to add more taste to packed sushi, rice or vegetables and fresh flavor to leftovers. 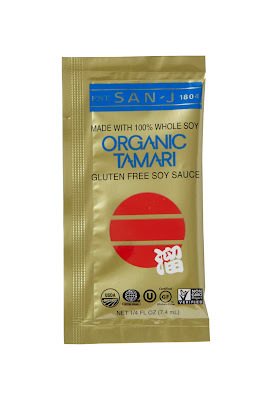 Unlike most soy sauces, San-J’s Tamari is a premium gluten-free Gold Label Tamari is brewed from 100% soybeans and contains no wheat for richer flavor. 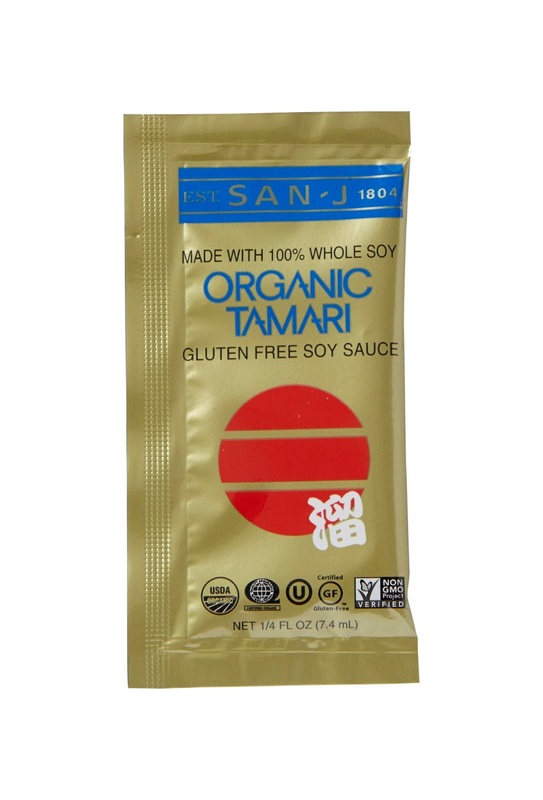 We really enjoy using the San-J's Organic Tamari in all our Asian-inspired dishes and we also use the Teriyaki and Orange in our crockpot meals, grilling and so many delicious recipes! I love the non-GMO status of all the sauces and the delicious taste! You can purchase San-J at a local retailer or online.